Tokyo Dark is a game about a cursed mask and ritualistic murder, but under the surface, it’s also a game about hurt people hurting people. Its complex writing and unique take on a sanity meter make it easy to care about the characters trapped in its tragic, bloody world. Tokyo Dark is an adventure game for PC that puts you in the shoes of disgraced Tokyo cop Ayami Ito. She’s trying to solve the murder of her partner/lover, which seems to be connected to a girl Ito shot during a hostage situation and a mask that makes her hear voices. Trying to summarize the plot of this game in a succinct way is pretty difficult, as its pulpy plot zigs and zags up until the final moments. You escalate from simple homicide to blood sacrifices as Ito gets closer and closer to the truth of her partner’s death. The supernatural mystery is tense and thrilling, and the game is a genre pastiche in the best of ways. 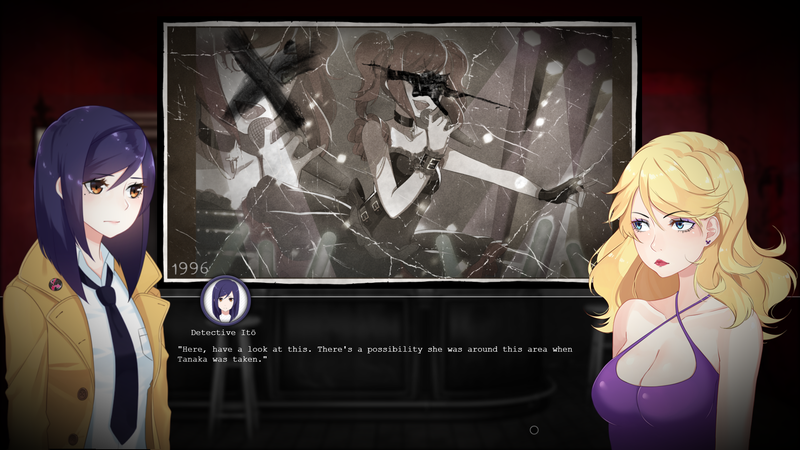 It has the dark industrial music of a cyberpunk thriller, its heroine is kitted out in a trenchcoat out of a film noir, and the game is intercut with anime full motion video. It’s got cults and Japanese mythology and a character named The Collector who speak in riddles. Rather than feeling overstuffed, it takes just the right elements and turns them into a game that’s more than the sum of its parts. This is complemented by warm, human writing that made me feel emotionally attached to the characters. Part of this connection comes from the game’s sanity mechanic. Too often sanity mechanics are used to mess with a game’s interface rather than reflect a character’s mental state. Tokyo Dark doesn’t just have one sanity meter, but four that interact with each other, called the SPIN system, which is explained after Ito has what appears to be a psychotic break during a hostage situation. Two of the games’ four meters—professionalism and investigation—have to do with Ito’s work life as a cop. Keeping those stats high can give her more resources in her journey through the game, like the ability to work with people at the police force. The other two—sanity and neurosis—reflect her mental state. A low sanity stat works how you’d expect: the dialogue changes subtly, showing a version of Ito who is being pushed to the brink. In one version of a scene with Ito’s neighbor, Yumi, Yumi seems creepy and sinister. In another, she’s just Ito’s normal neighbor who is worried about how she stays up all night and works all the time. How much Ito’s sanity is raised or lowered by in-game events is compounded by her neurosis. In a fun twist, neurosis is raised or lowered by actual neurotic behaviors. If the player has Ito spend too much time pacing rooms or streets, talks to characters too many times, or just has a hard time figuring out a puzzle, Ito gets more neurotic. It’s a small thing, but it helps the player feel connected to Ito. As I got more and more neurotic about not being able to solve a puzzle in real life, Ito got more neurotic in the game. It’s not a perfect system, but it does the job of making me feel connected to Ito. When she gains some stability for her mental health by eating some pancakes, it was a reminder that these simple pleasures can do a lot for your mental state. When I talked to the same guy over and over trying to trigger the solution for a puzzle, I felt as frustrated as Ito did. I wish that medication didn’t factor into this system, but after Ito’s psychotic break she’s prescribed anti-psychotics, which raise her sanity but lower her investigation. It’s a bit of a trope, and the game glosses over the reality of anti-psychotics and their side effects. I cared about every major and minor character I came across. Sometimes the people Ito chats with on the street have deep interior worlds that could be games in their own right. There’s a pair of Westerners in Akihabara Ito can talk to who eagerly tell her about the screenplay they’re writing. Down the street are a couple of waitresses from a cat-themed maid cafe who never break character. Even Taira, Ito’s rival at the station, has context and depth for his misogyny and jealousy of Ito. The majority of the people who play a major role in Tokyo Dark are women, and a lot of them are victimized by the world they live in. Ito faces some workplace sexism, and Reina, the de facto villain of the game, has had a life full of parental abuse. For a supernatural murder mystery, victimized women is par for the course, but as a player the small injustices in the world seemed linked to the creeping terror and cult sacrifices going on. Ito meets many characters who feel like their life has passed them by, or that they are tied to traditions that keep them down, or who strive to be themselves rather than submit to a system that humiliates and abuses them. The fact that there actually is an all-powerful force keeping people from being happy isn’t a huge surprise after talking to everyone. The people who live in the world of Tokyo Dark are already familiar with the feeling of watching their lives slowly drift out of their own control. Despite being a game about a cursed mask, Tokyo Dark is mostly a story about people. Like the best kinds of horror, it wants to reveal a fundamental truth about society. Rather than leave the player with a glib message of how bad society is, Tokyo Dark first shows you that even in an unfair world, people still have hopes and dreams, and they still have to live their lives. One of the first characters you meet is Miho, a bartender at a hostess bar. At first she brushes you off, saying she hates cops, but if you talk to her every time you’re in the neighborhood, she’ll warm to you. By the end of the game, if you treat her with decency and respect, she’ll even decide to leave her crummy job and thank you for being a friendly face. While Ito as a character was driven by a desire to avenge her partner, as a player I was driven by the people in Tokyo who were worth saving from whatever otherworldly horror that Ito dug up.